Julie Manet at Gorey. Berthe Morisot. 1886. Private collection. French Impressionist Berthe Morisot married Eugene Manet, the brother of French Impressionist Édouard Manet, in 1874. In 1878 they had their first and only child, Julie (1878-1966). We know few particulars of her childhood and her formal education. Through Morisot's art, however, we have an intimate look at their family life. 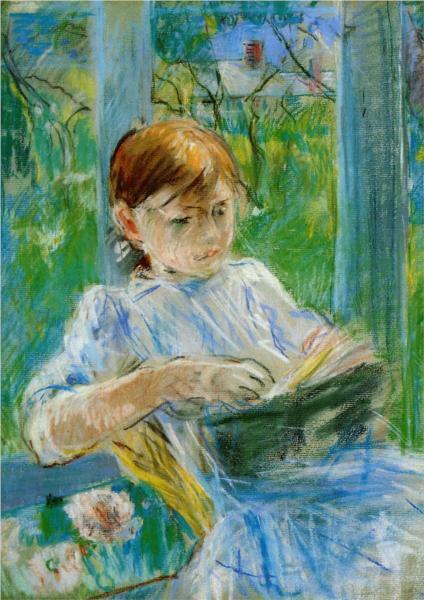 Though Manet was a less frequent subject, he appeared in other works, including Eugene Manet and his daughter in the garden at Bougival (1881) and Eugene Manet on the Isle of Wight (1875). For a period of six years, between 1893-99, Julie Manet kept a diary which details her teen years. Through Julie's writing there is a window into her adolescence when she was part of the legendary circle of artists and writers of late nineteenth century Paris. Monsieur Degas can think of nothing but photography. He has invited us all to have dinner with him next week and he’ll take our photograph by artificial light: the only thing is you have to pose for three minutes. Monsieur Renoir has been so kind and so charming all summer, the more one sees of him, the more one realizes he is a true artist, first class and extraordinarily intelligent, but also with a genuine simple heartedness.
. . . for some years now these [the Monets] have had nothing but sorrowful events. By the age of sixteen, Julie was parentless. In 1893 her father died. Two years later, after nursing Julie through a case of influenza, her mother contracted pneumonia and died. Stéphane Mallarmé, a Symbolist poet and close family friend, became her legal guardian. The greyhound pictured in the painting above was a gift from him to the family. Like her mother and her uncle Édouard, Julie had a facility for painting and became an artist in her own right. In 1900 she married fellow artist Ernest Rouart. They had three sons. For a period of six years, between 1893-99, Julie Manet kept a diary which details her teen years. Growing up with the Impressionists: the Diary of Julie Manet (Rosalind Debolande Roberts and Jane Roberts, 1988).